Even if you fall on the Android side of the smartphone divide it is hard to argue – without coming across as a raving crazy person – that there isn’t something a little crazy about the shear number of different Android devices out there. Be they from the likes of LG, HTC, Samsung, Motorola or anyone else, there are so many that naming each and every one of them just isn’t getting any easier. Most manufacturers these days have their own naming conventions and then base each new model on that. Take Samsung, for example. Their naming scheme is based squarely on the "Galaxy" brand. The Samsung Galaxy S, the Samsung Galaxy Nexus and so on. That’s all well and good, and everyone knows that anything with the word "Galaxy" in it is one of Samsung’s Android phones. That said, some of the names given to Android devices are downright crazy, and we’re sure you’ll agree to us in that matter. In the United States at least, it seems that no new Android smartphone can be released without it having at least one word such as "Epic" or "Sensation" in its name. If you can get "4G" in there as well, then you’re pretty golden. With all that in mind we bring you the Android Phone Name Generator – a web page which will generate a new name that would be suitable for any self-respecting Android smartphone. Spending just a minute or two hitting the button which generates the names, we were presented with one or two gems. It may be completely pointless, and yes someone somewhere clearly has their tongue pressed firmly into their cheek, but we have to admit we sat pressing the "Generate" button with a wry grin on our faces. The thing is, we’re not sure how things are ever going to get better. With so many Android devices being released and marketing departments desperate to get the attention of potential customers, these names are only going to get more ridiculous. 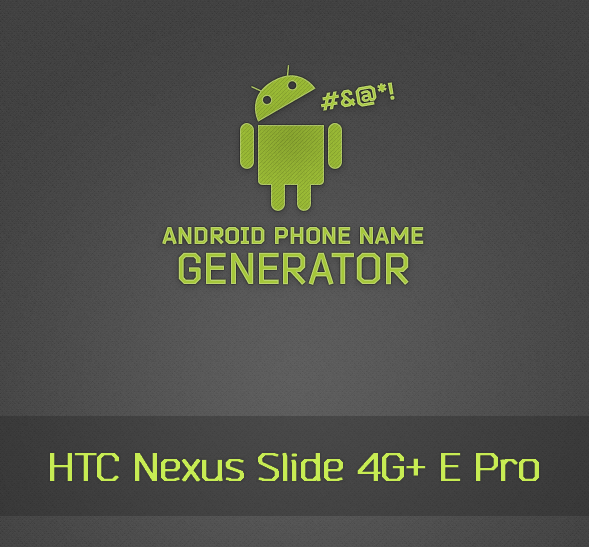 Give the Android Phone Name Generator a whirl and let us know if you come up with anything that is suitably epic and sensational!